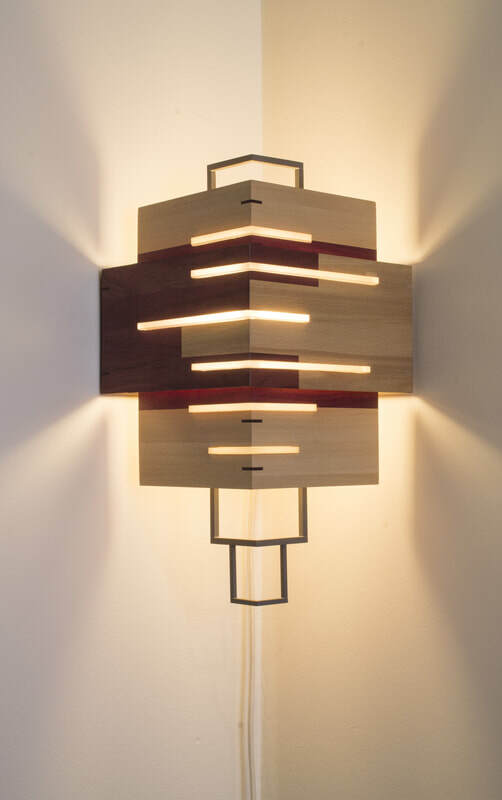 Each light is created from a variety of hard woods, steel, acrylic sheet, and occasionally cement. 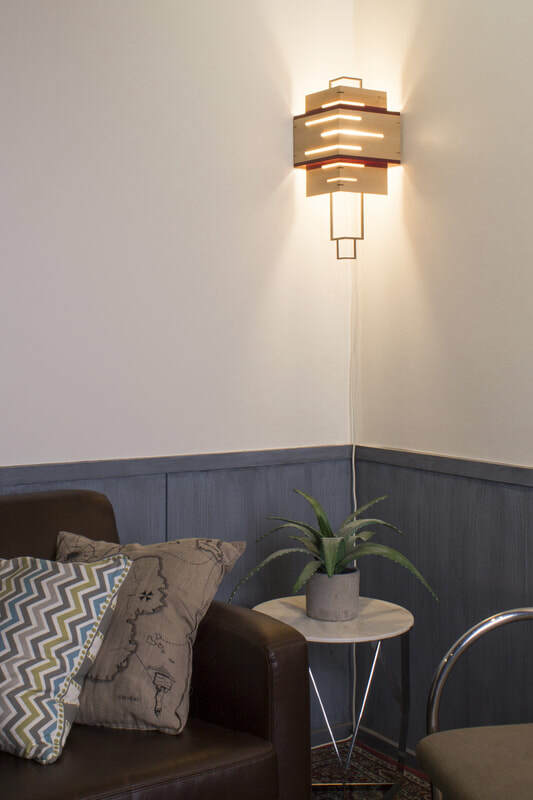 Creating a sconce to fit into the corner allows me to expand away from the wall and be more sculptural with the design. I am always trying to create new unique designs that push my fabrication abilities. 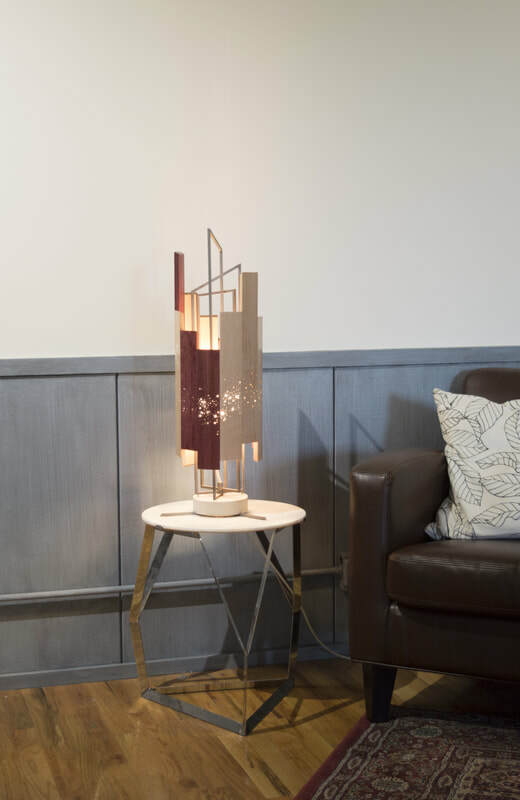 This table lamp incorporates a complex steel frame that complements the wood surrounding it. Hundreds of small holes were drilled into the wood to project additional light while also adding a beautiful celestial effect. Using compound miters at specific angles I was able to create two three-layer chandelier that taper to a point as the tiers get smaller. 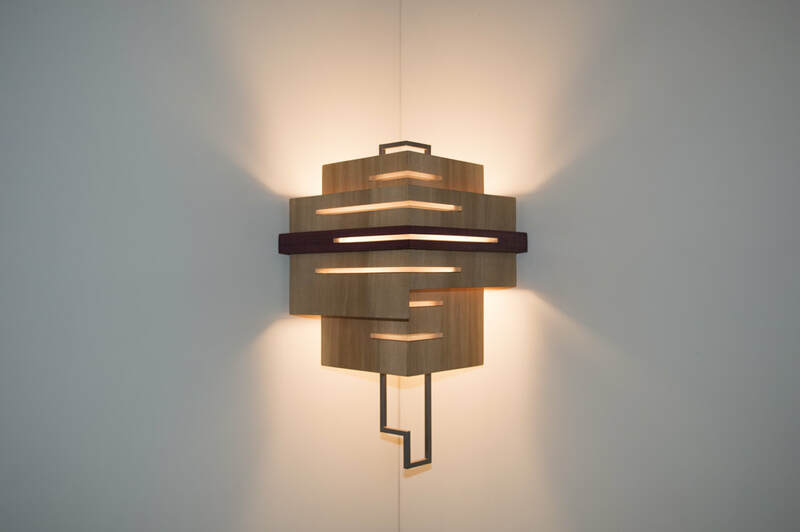 The asymmetrical steel frame around the light adds volume and compliments the angles and shape of the wood. Most of the lights use simple joinery to create complex and clean looking designs, but certain projects do call for more complex solutions. 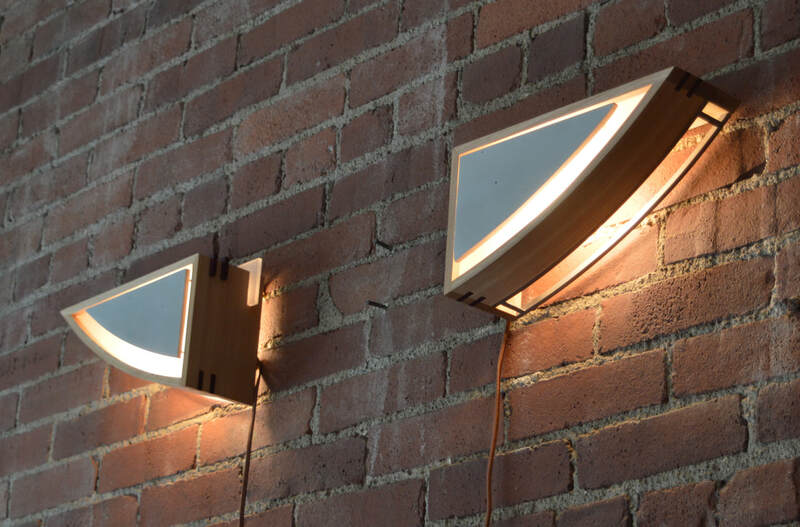 The sconce below uses three layers of bent lamination to create the arc form. 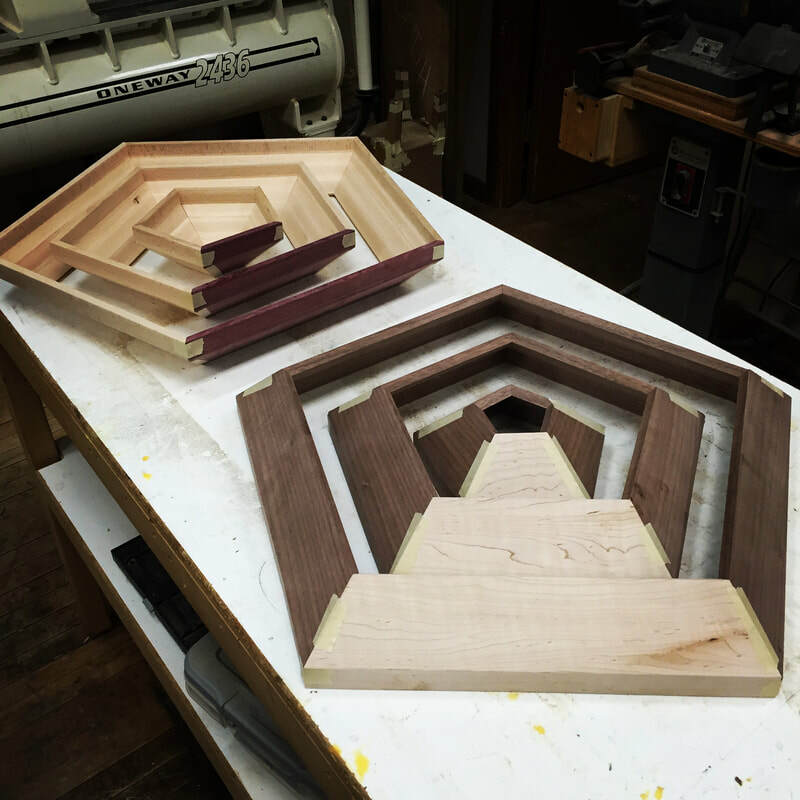 The layering of two different colored woods (beech and purple heart) adds a beautiful accent when viewing from various angles. Each light starts from an initial sketch, and then gets enlarged into a full scale drawing. It is only after these two steps are complete that I begin to gather the materials and commence measurements and fabrication. The metal frames are facilitated from 1/8" and 1/4" square stock steel. 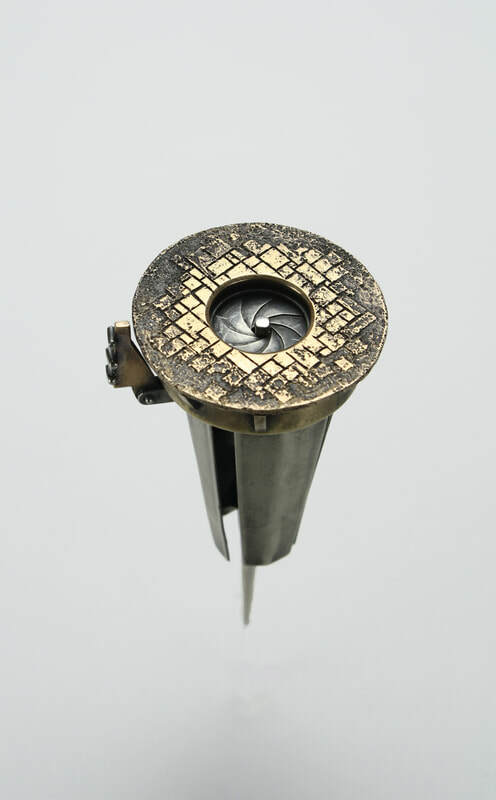 They are assembled by welding or soldering depending of the thickness of the steel and detail of the connection. By fabricating with mixed materials I can decisively create, conceal, and reveal physical spaces. 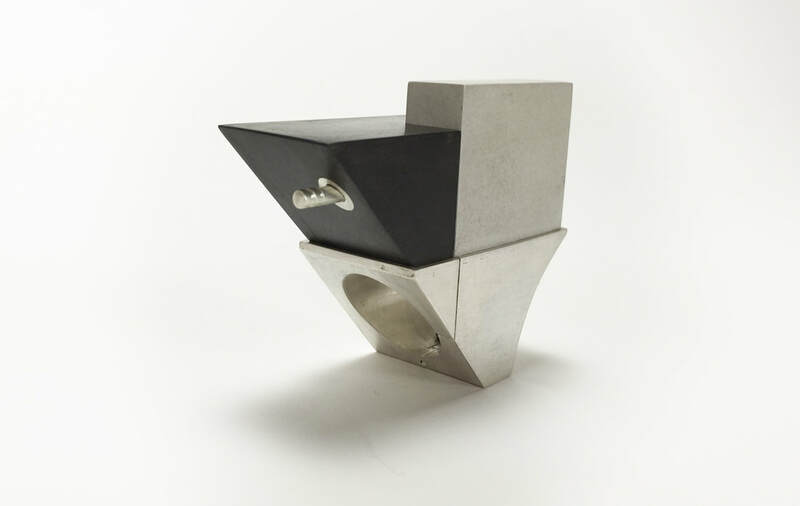 Powdercoat, wood, and cement elements promote an industrial look and feel while silver and gold leaf speak to the preciousness of jewelry. Incorporating mechanisms add a layer of interaction to the work. They allow the viewer to further explore the piece. 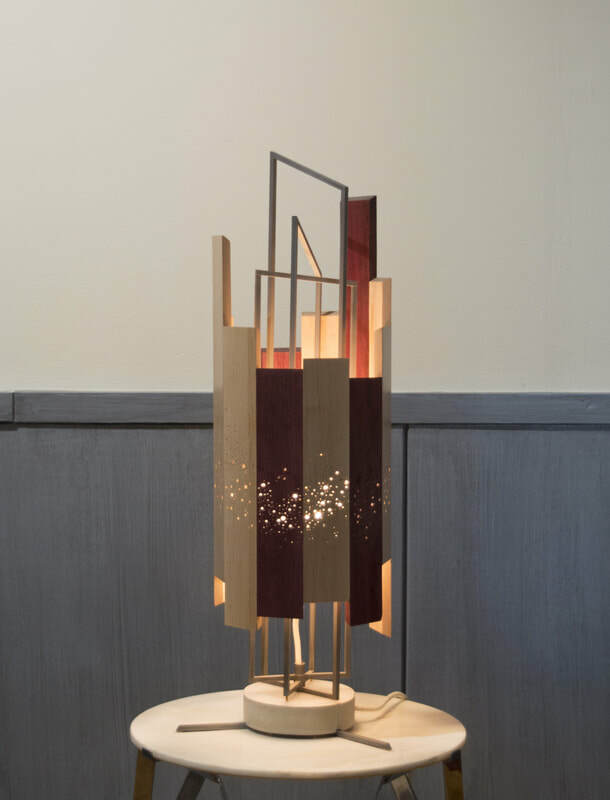 In each kinetic sculpture I try to find new and interesting ways of adding movement. I began with hinges and more recently introduced apertures.